Learn about the four grass types of your Maryland home. That old saying about the grass being greener on the other side may actually be true if your neighbor has a different grass type than you do. Many people assume that all grass is the same, but there are many different types of grass, and each type has different pros and cons and are best suited to different climates. In Maryland, we tend to have both very cold winters and hot summers, and there are four major grass types that do well through all of it. You should choose the grass type that best meets your needs and landscape conditions. This is a very popular landscaping grass type in the Maryland area because it is hardy enough to withstand long, cold winters but also can withstand the mild to hot summers we typically have. During drought conditions, it may need extra attention and watering from you, since it makes fairly shallow root systems. If you’re looking for a grass that you can let get a little long in the summer, this is a good bet. It does well at 3-4” tall in the summer. However, it should be kept shorter (2-2.5”) in the spring and fall. If your lawn gets a lot of shade, fine fescue is the grass type for you. Of the four grass types that do well in our area, it tolerates shade the best. It also tolerates drought and poor soil conditions without needing a lot of maintenance. You should keep it cut to about 3” for best results. It is a very fine grass, with thin blades, and it is considered a turf grass because it can cover large areas. It’s a good choice for overseeding a winter lawn that is dormant. If your goal is to have a green lawn for as long as possible, this is the grass type for you. Tall fescue is among the first green grass to come up in the spring and the last grass to turn brown come fall. Like fine fescue, this turf type is very durable, and it is resistant to disease and stands up to heavy foot traffic. It is best to keep tall fescue cut to 2-3”, and most growth occurs in the spring and fall. The biggest downside to this grass type is that it tends to cluster, so you may need to overseed to achieve a consistent lawn. This type of grass is popular all over the country and generally stands up very well to cold temperatures. There are varieties of perennial ryegrass that are resistant to heat and drought as well. This grass germinates quickly but spreads slowly. Even so, it makes a beautiful, full ground cover that comes back each year. Try to keep your perennial ryegrass short, about 1.5-2.5”, and remember that it does most of its growth during the cooler spring and fall seasons. 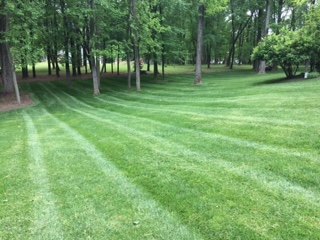 For the past ten years, Edwards Lawn and Home has been offering premier residential and services to improve your property all year long. The options are endless from a new patio to a backyard fire pit, let the winners of Angie’s List Super Service Aware serve you! If you’re interested in finding out more about our services or getting a quote, you can contact us online or give us a call at 443-341-6539. For more information about our services or DIY tips and tricks follow us on Facebook, Twitter, LinkedIn, YouTube and Houzz. This entry was posted on Thursday, March 28th, 2019 at 4:03 pm. Both comments and pings are currently closed.